Thor Hushovd (BMC Racing) took his biggest international win in more than two years as he sprinted to victory in the third stage of the Tour of Poland, between Kraków and Rzeszów. Following its two-day start in the mountains of northern Italy, the race had its first stage on Polish soil, with the Norwegian champion coming out on top in the sprint for the line. In second place, behind Hushovd, was Steele Von Hoff (Garmin-Sharp), just ahead of Australian compatriot Mark Renshaw (Belkin) in third. 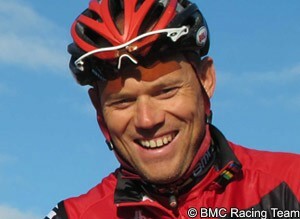 "The wind was coming from the left, so I knew he [Renshaw] would close the door to the right," Hushovd said afterwards. "So I was already thinking about this and knew I would have to go left. [My lead out man] Taylor Phinney did a good job and the whole team did really well. I'm really happy to get this win. I was quite confident today and the team had a lot of confidence in me – so that really helped." After a virus-hit 2012, and a slow start to 2013, his Polish victory was Hushovd’s third in recent weeks, after his third national title and stage win at the Österreich-Rundfahrt. Having apparently re-found the knack for victory, the former World champion was looking ahead for more in the coming stages. "I think tomorrow there's going to be another bunch sprint," he said. "There are also a couple of harder stages that might be good for me. So there still might be some interesting days to come." The rainy 226km stage saw a four-man breakaway from Alexandr Dyachenko (Astana), Bartlomiej Matysiak (CCC Polsat-Polkowice), Ricardo Mestre (Euskaltel-Euskadi) and Mirko Selvaggi (Vacansoleil-DCM), who managed to get ten minutes clear by the halfway point. By the time the quartet reached the three 6km Rzeszów finishing circuits it was just 1’30” ahead of the chase, which was led by Team Sky and Hushovd’s BMC Racing Team. At the bell the four riders were just 20 seconds clear and, despite an attack from Dyachenko, they were caught with a kilometre and a half to go as Argos-Shimano sought to lead out Slovenian Luka Mezgec. On the line it was Hushovd that was fastest, however, who took his first victory in the International Cycling Union (UCI) WorldTour since his two stages in the 2011 Tour de France. Safely in the peloton was race leader Rafal Majka (Saxo-Tinkoff), who held on to his yellow jersey on the first stage in his home country. Having enjoyed warm, sunny weather in the race’s first two Italian stages, the peloton was greeted by heavy rain as it began the third stage in Poland. After several unsuccessful attacks, and a number of crashes, in the early kilometres, Dyachenko, Matysiak, Mestre and Selvaggi escaped and were allowed to get away as the course made its way from east to west. By the midway point of the stage the four riders were more than ten minutes clear and, only into the final hundred kilometres, did the peloton begin to close it down. As Matysiak led the group across the first intermediate sprint of the day, in Strzyżów with 57km to go, it still led by 5’35”. Team Sky and BMC Racing were now leading the peloton together, however, and the lead was steadily shrinking. Matysiak led over the second sprint, in Lubenia with 39km to go, the gap was down to 3’30”, and as the Polish rider led over the 3rd category climb three kilometres later - the only classified climb of the stage - it was just 2’10”. Across the finish line for the first time with just 18km left, the quartet’s lead was just 1’30” and, with Argos-Shimano now at the head of the peloton, the group’s days at the front of the race were numbered. At the bell the four riders were just 20 seconds clear and, as the peloton closed, Dyachenko attacked. The Kazakh was quickly chased down by Mestre and Selvaggi, while Matysiak took longer to respond, but the break was all over with just a kilometre and a half to go. There were several attempted escapes in the final kilometre, but the sprinters’ teams kept the race together on the approach to the finish. Renshaw launched his sprint first, but Phinney led Hushovd into the final metres and the Norwegian champion was able to take his fourth victory of the season.